I have always wanted a bike of my own, but circumstances and finances always got in the way; but I never lost that hope and dream. This past year, almost everything in my life started to line up right. I met the man of my dreams, started to build a comfortable, loving life. It was time. My husband used to ride years ago, but his circumstances were always the same as mine had been until this past May, I told him even though we don't have bikes, I want us to take a course and get licensed so we are ready to go when the time comes. We took a rider safty course together at our local HD store, passed and got our endorsements. Not even a month later, a friend of mine said he was selling his 2003 Honda Shadow-Spirit for payoff on his lien: $2000. I couldn't believe my fortune. I love his bike. So, I paid him to pay off and the bike was MINE! 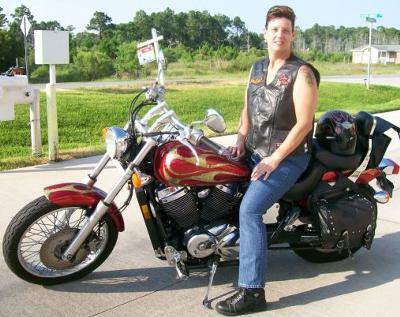 About 2 weeks later, my husband found one on Craig's list, a 2003 Kawasaki Vulcan 800 Classic for only $2800. We both love our bikes and ride often; some to work, mostly for pleasure. Enjoying every minute of our new life together; riding into the sunsets! Your bike is beautiful! I love the flames. I too started a new life, met a wonderful man who introduced me to motorcycles. We both ride together and we love taking trips. My bike is my freedom. So happy for you. I LOVE it when a plan comes together!! Congratulations on acquiring the bikes - and the gear I see from your photos - let the fun times roll! Love your bike. I too recently porchased a sportster from a friend for only $3000. Keep riding and be safe. Join in and write your own page! It's easy to do. How? Simply click here to return to Honda.